Getting ready to move to a new home in Lacey, WA means you’ll probably spend more time thinking about boxes than at any other period in your life. Most people spend the weeks leading to their move hunting for anything and everything cardboard. Yet because you have to fit nearly everything you own into boxes to make moving more convenient, your cardboard craze may have you believing that one box is as good as another. You’ll take any type of box you can get your hands on — and once you think you have enough, you’re ready to start packing. Conversely, having the right boxes can make a huge difference for your move. Although you may be appreciative for any boxes you can compile in the time before your move, just because you have boxes doesn’t mean you necessarily have the right ones. A box has to do more than hold items. It has to be the right dimensions and made of the right materials to hold the certain objects you’re storing. For example, if your box is too large for the items you’re packing inside of it, those items will have a lot of room to move during shipping. Meaning, you may open the box to find many of those items broke. A box that’s too large also may encourage you to fill it with too many objects — making the box far too heavy to lift or transport safely. On the other hand, even if the box is the right dimensions, it can fall apart easily if the materials it’s made of are too thin or flimsy. It’s essential to understand how choosing the right boxes can affect your moving process. Depending on the size and strength of the boxes you choose, there’s only so much weight you can load into it before its structural integrity can be compromised. 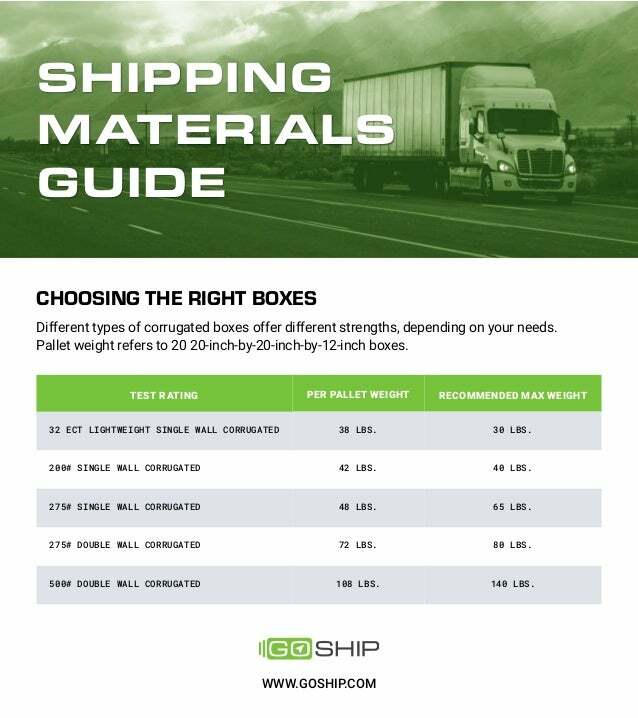 The following chart from GoShip.com can help you understand how much is too much when it comes to packing boxes for your next move. Don’t forget to take this information into account while you’re hunting for the boxes you’ll need.